Border Patrol dropped off 60 women and children from Central America at the Good Neighbor Settlement House Tuesday morning. Good Neighbor Settlement House Executive Director Jack White said a bus from U.S. Customs and Border Protection dropped the group off at the shelter at approximately 8 a.m.
“We’ve had a house full of young mothers and young children. We’re trying to triage them and determine whether we may have some more dropped off, trying to determine where we might put people,” White said. Border Patrol did not notify Good Neighbor Settlement House, White said, explaining that he learned about the drop-off after receiving emergency calls from staff at the shelter. However, after the bus arrived, volunteers immediately reacted. Catholic Social Services has helped with some clothing and shoes for children and White said he is reaching out to local churches about using churches for over flow. Sister Norma Pimentel runs the Catholic Respite Center in McAllen, where CBP has released hundreds of immigrant families. CBP said in a prepared statement sent to The Monitor last week, that migrants held at facilities are being released with a notice to appear in court, rather than being sent to a U.S. Immigration and Customs Enforcement detention facility. “The current increase in RGV apprehensions has resulted in the limited availability of space in the RGV central processing center and stations,” the CBP statement read. Last week, White said federal officials first told staff at the City of Brownsville that there would be large numbers of migrants dropped off in downtown Brownsville, but later, he said he was told that the mass releases would only take place in McAllen. “So this did come somewhat as a surprise,” White said. CBP has said large numbers of migrant families arriving from Central America are a burden on its detention facilities’ space—a claim groups like the Texas Civil Rights Project have disputed. According to CBP, the agency has taken custody of 36,174 family units across the southwestern border for February, with 14,448 family units originating from the Rio Grande Valley Sector. President Donald Trump last month declared a national emergency on the border so he could divert money from the military for border wall construction. 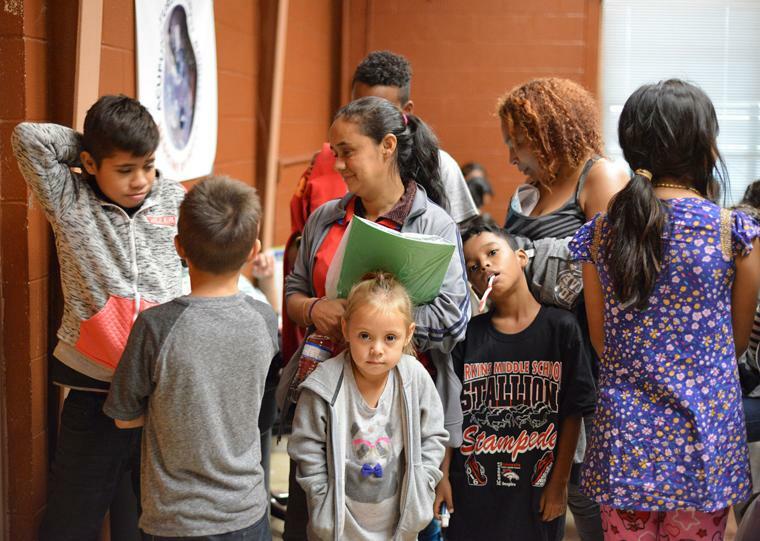 Christina Patiño Houle, Network Weaver for the Rio Grande Valley Equal Voice Network, said the release of migrants from the processing center and stations in Brownsville was the first of its kind. Before, CBP would release approximately 20 to 60 individuals who had posted bond from the Port Isabel Detention Center at the bus station all throughout the day. “So, it’s a different type of release,” Houle said. Houle said another significant development from the release of the migrants is that they are reporting to her that they are being held in the processing centers for longer than 72 hours, which isn’t compliant with CBP regulations. Last week, The Monitor in a collaborative effort with KRGV polled 100 immigrants waiting at a bus station and found the length of time they were held in the processing center ranged from one to 10 days. The Texas Civil Rights Project also posted on social media last week that it had interviewed numerous migrants who said they were held longer than 72 hours. But for White and the Good Neighbor Settlement House, the need for volunteers is urgent. “Well the main thing is we need more manpower and logistics for helping organizing transfers for some of these people … shuttling people to and from the bus station and airports,” White said. Houle said the immediate volunteer response to Good Neighbor Settlement House is emblematic of Brownsville responding to the needs of migrants. That effort over the year has even created new volunteer organizations, like Team Brownsville and the Angry Tias and Abuelas. “We have seen a lot of changes happen in the last year, but what we see in terms of the advocates, this is the moment we see the beauty of the community being highlighted,” Houle said.